Szimpla Kert is a definite go-to in Budapest for someone who loves to explore nightlife. Started in the year 2002, it has been the hot topic of the town ever since its inception. The founders of Szimpla instantly fell in love with this place which was lying in ruins and zeroed it in to bring about the concept that was in their minds. The pub is also famously known as Szimpla ruin pub and was made in the current location in the year 2004. The building had various houses and factories in the past but eventually lay in ruins, something that went perfectly with the concept. You can go enjoy a few drinks, see the place get lively at night or simply enjoy a lemonade with the owner. Prior reservation is not possible. 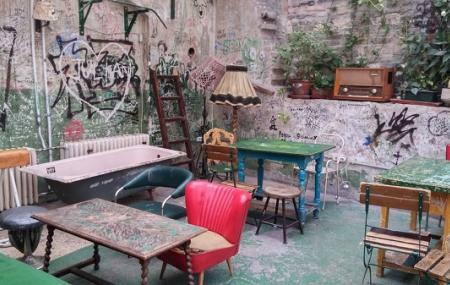 How popular is Szimpla Kert Ruin Pubs? People normally club together Palatinus Strandfurdo and Vorosmarty Square while planning their visit to Szimpla Kert Ruin Pubs. This was a very cool place to sit down and have a drink (or four). Visiting a ruin bar was on my wife's bucket list of things to do in Budapest and we were not disappointed. There is cool, funky, grunge vibe as soon as you walk in, so don't expect anything fancy. Drinks were surprisingly cheap. A shot, a beer, and a cocktail was less than $10US with tip. It was a fun place to drink and people watch. That place is amazing, it was great experience to drink there. Nice and very interesting ambient, you can you go there and look around all decorations. I recommend to try their cocktails with local spirits, these with funny names like Overdose 🤣 everybody should try this place! Better to go there sooner in the evening to avoid waiting in queue in front of the entrance. Cool, classic ruin bar. Has a wine bar, craft beer bar, and some food spots. You'll find all kinds of people floating around during the day. Great place to grab a beer and hang out or stop by at night for more of a party vibe. Feels more like an awesome house party than a club, which is pretty great.